Lyra Research will host a free, live Webcast that will deliver an in-depth review of the third-quarter financial performance of four of the digital imaging industry’s leading OEM’s—Canon, HP, Lexmark, and Ricoh. Lyra has provided extensive coverage of these imaging vendors' financial performance in the new online version of The Hard Copy Observer (http://observer.lyra.com/thelyraweb/). Charles LeCompte, Lyra's president, and Ann Priede, vice president of Lyra's publications group, will present the Webcast, which will be held on Wednesday, November 18, 2009, at 12 p.m. eastern standard time. Lyra Research, the digital imaging authority (http://www.lyra.com), will host a free, live Webcast that will deliver an in-depth review of the third-quarter financial performance of four of the digital imaging industry’s leading OEM’s—Canon, HP, Lexmark, and Ricoh. Lyra has provided extensive coverage of these imaging vendors' financial performance in the new online version of The Hard Copy Observer http://observer.lyra.com/thelyraweb/. Charles LeCompte, Lyra's president, and Ann Priede, vice president of Lyra's publications group, will present the Webcast, which will be held on Wednesday, November 18, 2009, at 12 p.m. eastern standard time. the positive impact of Ricoh’s IKON acquisition on revenue, and how currency exchange rates are influencing the company’s financial results. 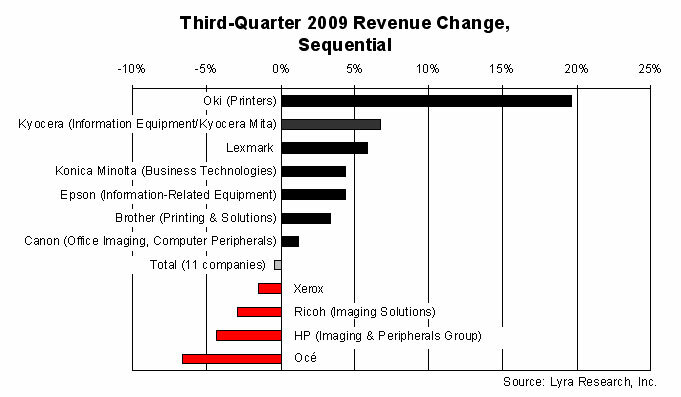 “The third-quarter financial performance of the printer-focused companies revealed some surprises. Many of the smaller players are gaining revenue traction, while some of the bigger industry names are losing ground. This is definitely an interesting trend that will keep things lively in the digital imaging industry as we enter 2010,” said Charles LeCompte, president of Lyra. Webcast attendees who are interested in receiving additional information about the financial performance of the digital imaging industry’s leading OEMs in 2009 should consider attending the 2010 Lyra Imaging Symposium (http://www.lyra.com/symposium). At this year’s Symposium, LeCompte and Priede will deliver comprehensive vendor scorecard presentations titled Vendor Scorecard, Part I: Copier/MFP Companies and Vendor Scorecard, Part II: Printer Companies. These in-depth presentations will include an industry overview of the recession and the economic recovery; vendor financials; the percentage of revenue vendors are spending on technology/R&D and advertising/marketing; and vendor marketing and technology initiatives and sales highlights. To take the new online Hard Copy Observer for a test drive, go to http://observer.lyra.com/thelyraweb/ and click on “Not a member?” in the upper right-hand corner of the home page to become a free user. Free users are able to view the story headlines and get a glimpse into the newsletter’s online content. Free users can also sign up for the weekly e-mail distribution list, which will provide them with the headlines of the most recent articles. To view the full stories, users must upgrade to a 12-month subscription. The cost for a year of access to the online Hard Copy Observer is $750. New members who sign up by November 30 will receive $50 off the regular subscription rate. To register for the free, live Webcast, go to http://register.webcastgroup.com/l3/?wid=0661118094977. For those who are interested in the Webcast but are unable to attend, a Web archive will be available within 24 hours of the live event at http://www.lyra.com. Lyra Research's Webcasts provide attendees with engaging presentations regarding the digital imaging industry's hot-button topics. Lyra's Webcasts offer imaging industry executives, marketers, and analysts an accessible and informal resource for insight and useful data points regarding timely issues in the hard copy hardware and supplies industries. No special software is needed to attend the Webcast. Only an Internet connection and browser and audio capability are required. To view Lyra's library of archived Webcasts, go to http://www.lyra.com/WebCasts.nsf/F4BAF46C629BA31F85257020004AB00E. To receive additional information regarding the online Hard Copy Observer or the 2010 Lyra Imaging Symposium, please contact Sandy Tobin, client relations manager, at 617-454-2612 or stobin(at)lyra(dot)com.